Antonia Campus, Notes on Costs and Price: Malthus and the Marginal Theory. 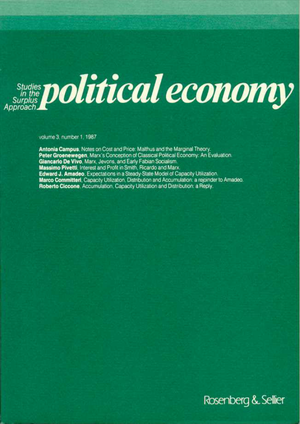 Peter Groenewegen, Marx’s Conception of Classical Political Economy: an Evaluation. Giancarlo de Vivo, Marx, Jevons, and Early Fabian Socialism. Massimo Pivetti, Interest and Profit in Smith, Ricardo and Marx. Edward J. Amadeo, Expectations in a Steady-State Model of Capacity Utilization. Marco Committeri, Capacity Utilization, Distribution and Accumulation: a rejoinder to Amadeo. Roberto Ciccone, Accumulation, Capacity Utilization and Distribution: a Reply. Centro di Ricerche e Documentazione " Piero Sraffa "